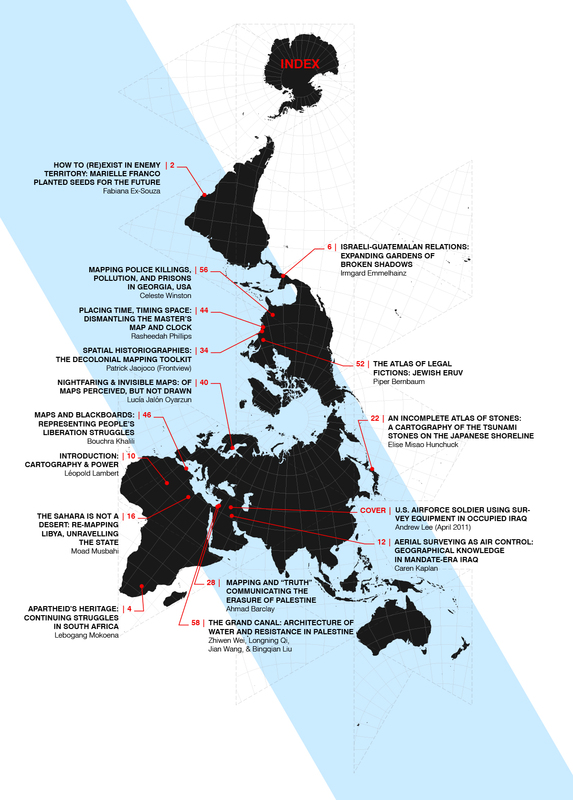 Cartography & Power is the eighteenth issue of The Funambulist. Just like architecture (which requires plans, i.e. cartography, to be designed), cartography does not constitute a neutral discipline that can be equally used to implement either state violence or resistive endeavors. Cartography is inherently an instrument of power and, as such, it has the propensity to facilitate the violence of military and administrative operations. All contributors to this issue begin (whether explicitly or not) with this axiom and seek for methods of mapping that can serve political struggles mobilizing against the dominant order. The issue starts with a historical and contemporary examination of the simultaneous production of colonial maps and territories in Iraq (Caren Kaplan) and Libya (Moad Musbahi), or how maps can erase a past existence on these territories, like in Palestine (Ahmad Barclay). Attempts to “decolonize mapping” (Patrick Jaojoco), “dismantle the master’s map” (Rasheedah Phillips), or to describe “maps perceived but not drawn” (Lucía Jalón Oyarzun) are also featured. Furthremore, maps do not necessary represent territories; they can also make visible the historiography of political struggles (Bouchra Khalili). The issue also features two atlases, bringing attention to the Japanese tsunami stones (Elise Misao Hunchuck) and the Jewish Eruv (Piper Bernbaum). The three guest columns that open the issue are dedicated to the legacy of Marielle Franco’s fight in Brazil after her assassination (Fabiana Ex-Souza), the continuing struggles against racism and colonialism in South Africa (Lebogang Mokoena), and the close links the Guatemalan and Israeli governments have developed for decades in their oppression of Indigenous and Palestinian people (Irmgard Emmelhainz).